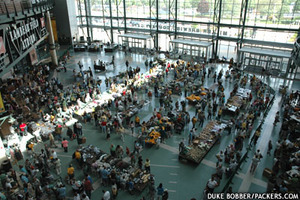 According to the Packers official website (see press release), the 16th annual Packers Pro Shop Tent Sale is set for June 5 and 6 in the Lambeau Field Atrium. The sale is open from 9 a.m. to 5 p.m. each day. The site also said that there will be Packers game-worn pants, travel bags and more. I just wanted to let everyone know that there are two Green Bay Packers blogs on the Net that are very good. Collectors Chance Michaels, and my good buddy Guy Hankel each are advanced Green and Gold gurus, who have went the route of sharing their knowledge with fellow collectors. In other news, this is usually about the time the Packer Pro Shop usually hosts its annual Tent Sale. This sale isn't what it used to be, as I can remember stocking up on hundreds of game-worn pants at dirt- cheap prices, and also have heard stories of one of the first sales selling 1950s game-worn capes, but it's still worth attending. What if Favre becomes a Viking? Good ol' Brett Favre. I've never enjoyed watching an NFL player more than that country boy from Mississippi. Ever since I was 14 years old when I attended his first start in Sept. 1992 I knew something was very special with Favre. However, I never could have predicted even part of the soap opera that has taken place with since that sunny day when the Packers defeated the Steelers at Lambeau Field. What are my thoughts on Brett's possible return as a Minnesota Vikings starting quarterback? Simply put, I hope he comes back. The hype that Monday Night Football game when the Packers travel to Minnesota would be amazing. That said, I don't look at Favre the same way I did when he was slinging touchdowns with the Green and Gold. Maybe I'm a bit selfish. I mean, who am I to say Favre is a jerk for leaving GB and going to a different team? If an everyday citizen has a job for 20 years, and then changes his place of employment suddenly, nobody would say a word. How is an NFL player any different? Even though I understand that rationale, it still burns me out that he is not a Packer. Who's at fault here? Favre, Ted Thompson, the media or nobody at all? Maybe I'm also a bit upset that Favre's legacy has been tainted ... Maybe I'm ticked that the one part of my childhood I was able to hold on to for many years may end up with the enemy ... Maybe I am taking this all too seriously. Anyway, I wanted to get the opinions of various CollectGreenBay.com correspondants on this topic. We got input from Green Bay natives, a respected magazine editor, Wisconsin's funniest comedian and even threw in a Bears fan for good measure. In addition, we want to urge all readers of CollectGreenBay.com to put their thoughts in the "comment" field as well. I really feel that Brett Favre returning to the Minnesota Vikings would be great for football, great for the NFC Norris (do they call it that anymore? – I guess not since there is no more Norris Division in the NHL) and great for me as a fair weathered Chicago Bears fan. I think the returning of Brett Favre will lead to the two Vikings – Packers games will be the highest rated games of the year – No doubt. I would predict Brett Favre to have a career day in one of the matchups and beyond that who knows. I see the NFL North now has Jay Cutler who comes to a Chicago Bears team lacking depth at receivers, with his main focus possibly being Greg Olsen unless Devin Hester can adapt or Earl Bennett develops playing with his old Vanderbilt quarterback. From there, I do not see The Green Bay Packers developing as quickly as they would hope in the Aaron Rodgers era. Plenty of talent on offense for The Packers, but the team has just not clicked for the Aaron Rodgers lead group. Then there is the Vikings who have talent all over the place and maybe Brett Favre can bring them together, but I just don’t see it. A team counting on Tavaris Jackson who has not developed into the star he should be has been sad to watch. The best running back in the league with former Chicago Bears wide receivers who have not lived up to expectations in Minnesota to date. Maybe the old veteran can boost the morale for his last run (or two) in the NFL. I believe Brett Favre wants to beat The Green Bay Packers and he may return just for that reason. The Green Bay front office let down The Franchise by giving up on them before he was given a chance to quit on his own terms. I see this as his motivation to return and bring more ratings to the NFL’s already strong viewership. I believe, if Minnesota finds him healthy, they will take him with open arms. If he goes to play anywhere else, it will be a blemish on his career. Last year was already a blemish – He doesn’t need anymore. Brett Favre is an institution that should be appreciated for what he has achieved and what may come in the future. Did I forget to mention the final team in the NFC North? What a joke they passed on an offensive lineman with that #1 pick – You have to rebuild from the OL up. Brett Favre is #1 in so many records on the field but sometimes in our haste to judge people, we are blinded to the obvious. Between Brett's Fourward Foundation, Breast cancer awareness created by Deanna's situation, Charity Golf Outings, Katrina Relief~ a whole page on charities and millions of dollars Brett has personally donated and millions more he raised to benefit needy people. Brett could be the ALL-TIME LEADING CHARITY FUNDRAISER for an athlete! Brett also was responsible for the GB Packers Proshop making over $1,000,000 annually in sales of #4 jerseys over 10,000 annually for over 5 years. The top selling jersey in GB last season was still Brett Favre #4. Brett Favre, according to the Packer's own media guide, signed a LIFETIME CONTRACT TO INSURE BRETT WOULD RETIRE A GB PACKER on March 1. 2001 and Favre stated at that time"I enjoy it here. I don't want to move. I enjoy the fans and I just want to stay. I couldn't envision myself playing with another team" This is Brett's team more than Ted Thompson's. PROMISES WERE MADE TO BRETT LONG BEFORE TED THOMPSON"S ARRIVAL. Brett was underpaid compared to his contemporaries. Players were drawn to GB when Brett was there. Now its back to the Siberia of NFL days! There were so MANY reasons to allow Brett to return and finish his career with the team and fans he loves and let him go out on his terms. But no, TT went with HIS pick- get over the Favre era even if Brett isn't finished. Bribe him with a marketing agreement~ viewed as an INSULT. Announce to the world, Mark Murphy says I want to welcome back our legend Brett Favre and 1 day later the coach decides to OVERRULE the President of the Packers and WE THE FANS are stuck with this MUTINY/TREASON/SHORTSIDED/ FINANCIAL DISASTER coach's decision? Then trade him to worst team you can find instead of opening up the bidding IF YOU TRULY THINK Brett is washed up~ instead stick a playground clause to keep Jets from trading him. BUSHLEAGUE. Brett did get beat up but won twice as many games a s Jets did without him. Talk of 4th MVP in middle of season after Brett threw 6 Touchdowns against Super Bowl Cardinals and beat Patriots and Titans on the road, in back to back HUGE UPSETS! Sure Brett threw ints, new receivers, tipped passes, receivers ran wrong routes. Half Brett's ints came in games the Jets WON~ they shouldn't count. We all know Rodgers had a good year even though the Packers went from 14 WINS to 6! The revenues dropped off the board and gameday tickets were available at the ticket window for face price no limit! Now some want to chastize Favre as a Benedict Arnold. Brett NEVER WANTED to LEAVE~ 2 people wanted him out! They got their way and HUGE LONGTERM CONTRACTS FOR THEMSELVES. $4.5 million and $4 million AND NEITHER ONE PLAYS FOR THE TEAM! If history repeats itself. No coach or GM has made it more than 11 years except Curly Lambeau. Either they are too successful and a billionaire owner make them and offer they can't refuse~ Lombardi and Holmgren or the team struggles and out they go! 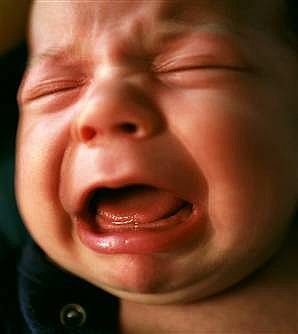 Rhodes went 8-8 and got fired! Brett FUNDED teh JETS portion of the new stadium. Pre-Favre there was no one to send the PERSONAL SEAT LICENSE BILL to. Jets were on the bottom in NFL sales and merchandise, even though WORLD'S LARGEST MARKET! Brett goes there and demand soars for tickets, PSL's, JERSEYS, etc etc. The Jets get funding for stadium and $100,000,000+ BOOST and UNPRECEDENTED leap from near last to near FIRST in sales! 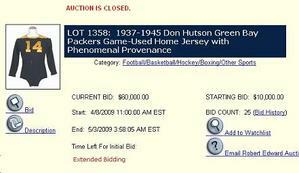 7,500 Favre jerseys sold in 1 day on 1 website, old record was 900. OK, Favre to Minnesota? PLEASE ANYWHERE BUT THERE! ANY COLOR BUT PURPLE! YET, WHO NEEDS STADIUM ASSISTANCE NOW? WHO will have TROUBLE selling PSL's for a new stadium that construction needs to start on NOW, before the owner MOVES the TEAM? Vikings couldn't sell out their dome EXCEPT for Packers games, how are those fickle fans ever going to be convinced to ante put $2,500-$10,000 per seat and you need to sell practically ALL of them because the people that paid won't like it if others d idn't have too! FLASH IF BRETT CAN DO FOR THE VIKINGS WHAT HE DID FOR THE JETS~ Vikes will get boost for stadium, Vikes will make MILLIONS on #4 PURPLE JERSEYS and get some PAYBACK on rival~ WIN WIN WIN for VIKES or ANY TEAM that takes Favre~ even if he doesn't finish the season! Ted Thompson should have seen this coming and for this reason ALONE~ BRETT SHOULD HAVE BEEN ALLOWED TO RETURN! IMAGINE the hype if Brett does return. Ad revenue for his "LAST' game, MNF at dome vs old team GRUDGE MATCH. 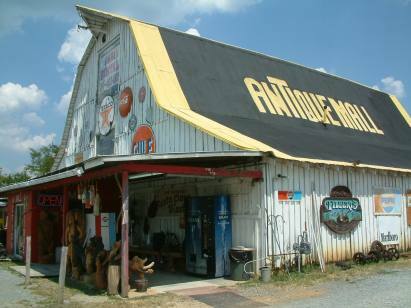 IT SELLS but IT STINKS! Talk about shooting the goose that lays the golden egg and now the goose bites you before he retires. Favre returning in my opinion would be a big plus to the NFL. Consider the media coverage for both teams. The hype surrounding the big games between the Packers and the Vikings would go through the roof. Think of all the items that could be available for those games. It would be a collectors dream at the very least. I feel that many fans will get to see their hometown hero at least once more before he hangs it up for good. Heck if he wants to play let him play. Some fans are so upset by his return , but I say what the hey.Here's a thought, just remember the good times. Look at what he meant to the team and the league. Look at the great record he can break of consecutive starts that he would break. Consider the other records he can tack good numbers on to. We enjoy his play no matter what team he plays for. Favre is still got that spark that we all had when we were children for "the love of the game". Certainly don't you miss that at least once in a while in your lives? Look deep in your soul and tell me you don't once in a while. One important point that's missing from all the talk for and against his return is simply this. To the owners , the teams, the players, the agents etc. it's (football) a big business. There are a lot of dollars and cents thrown around every day. But to real fans it's that little child that still lives in us forever. It's still just a "game" . Please for goodness sake don't ever lose that feeling. It's just a game. If he does retire...and stays retired...I will feel relieved for him. Part of me just wants this to all be over for that reason. If he does decide to come back, however, I will definitely root for him...just not against Green Bay. I suppose my perfect scenario would be Favre throwing for 300 yards and 4 touchdowns every week, but the Vikes losing by a field goal. As a Packer fan, I would feel no ill will toward Favre if he should decide to play for Minnesota. He did everything the Packers asked him to do as an employee of the team. Now that the Packers no longer employ him, why shouldn't he be free to do whatever makes him happy? People who feel "real" emotion about this may be taking this game a bit seriously. What would a dawn of another upcoming NFL season be without another controversy swirling around Brett Favre? I, like many, grew up idolizing a player that had every attribute you could ask of an athlete. He was arguably the best at his position, appeared to be a simple, down to earth guy, and played with the passion and desire that inspired us all. I backed Favre when it came to his past indecisiveness to retire and whether he should be the starting QB in Green Bay last season. I felt Green Bay owed him that room to decide what he truly wanted to do. He earned it based on what he gave Green Bay over the years. Given the latest in the Brett Favre saga, I am now questioning if I was backing the right side in the situation. I have come to admire superstar players like Jordan, Montana, and Magic for not listening to the fans and media cry about tarnishing their legacy by playing too long. There is nothing more genuine than to see an athlete past his so called “prime” compete and battle, not because of legacies or awards, but for the pure love and burning desire for the game. I felt that Favre fell into the same category until recently. Forget about the fans and media, what about teammates that he is impacting? He has caused turmoil in locker rooms of Green Bay, NY Jets, and now Minnesota. I just read an article where Vikings LB – Chad Greenway stated concern about where Favre’s loyalties lie. When I take into account of how much chaos Favre has caused by his decisions, it is hard for me to stick behind him anymore. It is difficult to speculate about Favre’s intentions without speaking directly to him, but it appears that he holds little regard on how his decisions impact others in his very own locker room. When it all boils down to it, in years to come, Favre’s legacy will remain intact as it usually does for all superstars who play past their so called “prime”. However, unlike those legends, Favre has burnt bridges and created more headaches in the process. Given my dislike for the Vikings, I hope he signs with them because they deserve everything they got coming…. Favre has always made football fun to watch. He's a southern guy who loves to play the game and that's all he knows. He's gonna play until his body doesn't let him. It may be ugly, but I don't think he thinks about that. Having a legacy isn't in his vocabulary. If he's got some gas left in the tank, I think he should come back. It sure would be compelling to see him in a Vikings uniform in Lambeau. If that happens and I'm lucky enough to see him trot out of the visitors tunnel for warm-ups, I'll just stand there and take it all in. How can you boo Favre after all the excitement he's given Green Bay. He's not playing on another team to "stick it" to the fans. I do think he's driven by other reasons, but I don't think us Cheeseheads should take it personally. He's still better than half the starters in the league and the Vikings know it. Yeah, it would be awkward to see him play for the Vikes and we all know he's a drama queen. I know I can look past the media driven frenzy that has happened for the last half-dozen seasons and still appreciate what he does on Sundays. The NFL is a better league with him in it. It has gotten to the point, as a Packers fan, that I am sick of Brett Favre. 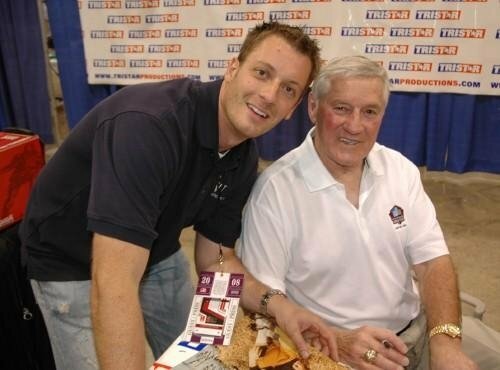 I followed him since that fall afternoon he beat the Bengals in '92 and loved watching him good and bad. It just seems to me that he is doing this to get back at Packers GM Ted Thompson. If that is indeed the case, it is sad. I hate seeing 16 years ruined by this move. Before this, I wouldn't have missed Favre's induction into the Hall of Fame. Now I don't know. Several weeks ago I was writing a description for an auction lot and jokingly referred to the item being hammered down at just about the same time Brett Favre changes his mind and decides to unretire. I was sorta kidding, but then a couple of days later all the speculation broke out about Minnesota. I can’t pretend to having any more inside dope about it than anybody else (though I did hang with him on time at the driving range as he practiced while I interviewed him), but that disclaimer aside, I would expect him to make every effort to play again – and presumably for the hated Vikings – PROVIDED he feels well enough physically. That’s not particularly insightful, but there it is anyway. I also think it would be great fun simply in the drama department to have that already overheated (over-hyped?) rivalry have that kind of monkey wrench thrown into the works. The thought of Favre at Lambeau in the purple uniform with the funny horn thingys almost gives me the vapors. If Brett Favre comes back, it would be proof positive of his Attention Deficit Hyperactivy Disorder. ADHD in adults is particularly misunderstood. Most people think it is about an inability to focus. It isn't. ADHD is about a superior ability to focus- but only on whatever it is that is the most stimulating in the moment. 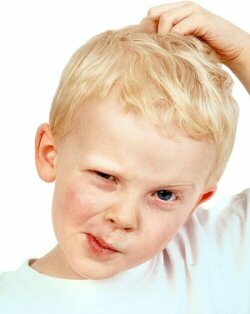 Little is known in the general population about adult ADHD. It is estimated that only 15% of adults that life with it have any awareness that they do. Many people with ADHD are as successful as they are because of their ADHD. ADHD sufferers tend to gravitate toward significance occupations- lawyers, doctors, athletes, comedians, quarterbacks. They need to be in a position to gain the significance in their professional life that might make the pain of growing up with an undiagnosed ADHD caused. ADHD suferers deal with more ridicule and criticism than people who don't. Often, it gets internalized. Success in a significance occupation is quite a tonic. ADHD sufferers are more apt to be overwhelmed, so they develop a wide range of coping mechanisms. Musician Ryan Adams is a sufferer. He released 3 albums in 2007- one of them, Cold Roses, was a double album. His coping mechanism is to isolate himself and write songs. All of his songs are about conflict and heartbreak and promises he wasn't able to follow through on. Clasic symptoms of ADHD. Heartbreak that you can't move on from is what is known as stuck-in-your-way thinking. ADHD sufferers often medicate by creating conflict- conflict is high stimulation and it releases a fight-or-flight response in an individual's central nervous system. Not being able to follow through on promises is a classic ADHD pattern of big thinking and extreme overwhelm when it comes to putting the big idea in action. There isn't much better stimulation than the drama of being a Quarterback and Brett Favre has been a quarterback all his life. He married the head cheerleader of the high school that he played quarterback on the football team that was coached by his own father. Highly stimulating. He found himself addicted to alcohol when he couldn't get on the field during his first NFL season with the Atlanta Falcons. He found his stimulation off of the field- a phenomenon we've been seeing all too well with noted ADHD sufferer Michael Phelps. Idle hands never stay idle that long when one suffers from ADHD. Breatt Favre will play for the Vikings this season. ADHD sufferers have a deep need to win any breakup that they don't initiate. This is the only way he really can. He owes the Packers a mega motherfucking for what they did to him. He literally can't help himself. His stuck-in-his-way thinking makes it an absolute inevitability. All this is cool by me. I'm a comedian from Green Bay Wisconsin and I never got any national recognition until I wrote a bit entitled "Gay for Favre". It became a minor sensation and I was able to capitalize on it a bit by creating a line of merchandise that declared that I would go "Gay for Favre". I was expecting a championship run in 2008 and those shirts were supposed to sell like hotcakes. When he retired in 2008, he submarined my momentum. When he hinted that he wanted to return, I got caught up in the excitement. I was going on national radio as "The Favreologist" an NFL insider that knew how to interpret Brett Favre's every action and word. I ordered another round of shirts. 2008 was going to be the year the whole nation went Gay for Favre. Then he got traded. I had hopes he'd see some success in New York and he almost did. Producers from Letterman were emailing me and looking for clips of the material when the Jets looked like a strong contender. Those emails stopped coming when they faded down the stretch. The ignominious end of his season with the Jets means it will be unfairly remembered as debacle akin to Namath taking snaps for the Los Angeles Rams or Willie Mays ruining his legacy with the New York Mets and that is completely unfair. He threw for 6 touchdowns in one game last season, Namath just grew a Fu Manchu with the Rams. Favre has his legacy to protect and he can do that by handing down the ultimate face job to the Green Bay Packers by winning sa Super Bowl with his arch Rival. It would rank higher than the "Grudening" of Al Davis in SuperBowl 37 on the revenge scale. As a Favre fan and a revenge fan, I'd love to see it happen. About three years ago, in my previous blog on the SCD site, I ran something similar to this. This will pose as my first installment of "Hidden Landmarks in Green Bay." For no cost any Packers fan or football historian can travel to these spots. Problem is, not many people know how to find these spots of Packers history. Well, as long as you have a good GPS and the address you can find these places easily. Stay tuned for installment two, coming soon. - Recently discovered as the place Lambeau was born, this small brick house is one of the oldest buildings in Green Bay. house was a hop, skip and a jump from Old City Stadium. Now the home of the Green Bay East High School football team, Lambeau and his Packers played here through 1956.
rendering of another Packers coaching legend, Vince Lombardi. I couldn’t believe how small this grave stone was. About the size of a notebook, this gray marker is right next to Curly’s father and mother, Marcel and Mary. Just a quick note that Titletownnostalgia.com is new and improved and is now LIVE again. This is our sister site and we hope you will find some interesting additions to your Packers collection, or at the very least, see some nice pieces you have never seen and treat our storefront kind of like a museum. I did something last week that I hadn't done in about ten years ... I took a drive down to the Neville Public Museum in Green Bay. 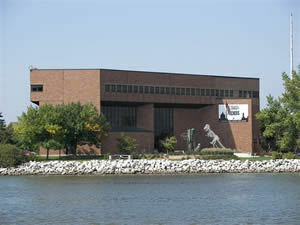 For those of you who don't know much about the museum, it's located on near downtown Green Bay and have some great exhibits. I wasn't sure what Packers items were on display, but was pleasantly surprised. Not only did the Neville have a 1923 Packers Corp. stock certificate on exhibit, but it also featured eight exclusive videos documenting interesting aspects of the team. It cost me only three bucks to get into the museum and that was a steal considering I got to watch all eight videos at that price. One thing interesting about the stock cert they had on display ... It was notated as a "COPY." But I really think it was an original, due to the perforation you could see on the left side. I would like to hear others' opinions on this, as it was very interesting to say the least. One other thing about the Neville ... Some time ago the Green Bay Press-Gazette donated their Packers photo archives and slides to the museum. Anybody interested can actually set up a time to go through all the photos and slides. All the team photo negatives dating all the way back to 1919 are kept in this collection. The collector value on this stuff would be through the roof, and it is accessible to anyone interested. Simply amazing and definitely worth a look. This jersey had a lot of things going against it... Granted, it's one of the best Packers game-worn jerseys I've ever seen in my life, but in this economy nothing is guaranteed to do well. Also, there were many holes in this shirt... it is rumored that there are 85 holes in all, although I can't see THAT many from the photos on Robert Edward's site. Still, this fine piece still sold for $60,000. I predicted it would sell anywhere from $40-60K, so that fact that this sold on the high end of my prophecy it is a very good sign for the vintage Packers hobby, game-used memorabilia in general, and of course, Robert Edward Auctions. It's a bad economy ... Okay, horrible. Everybody seems to owe money and bills are stacking up. So, why the heck is eBay so darn dry. Since I started using "The Bay" in 1995, I have never seen so few quality items. Is it because the people who own quality items are doctors, lawyers and people who don't need this cash? Maybe has something to do with it, but that can't account for this entire situation. Is it because people hanging on to the quality items assume nobody will pay normal prices for their items, so they are kind of holding on to them until the economy gets better? That may be part of it too, but there has to be a group of people who need cash, and can't wait til things get better. I really would like to hear other people's thoughts on this. What happens when an auction house goes belly up? I know that this topic may have nearly the same effect as when hearing fingernails on a chalkboard, but with the recent alleged FBI investigations to auction houses and the horrid economy, I think this is a valid one. Ever since I've been dealing with auction houses, one thing that always struck me as unusual is that many of them have poor customer service. Whether it's ignoring customers' emails, or paying consigors late, for whatever reason auction houses and their workers seem to ignore obvious customer service qualities and act like arrogant fools. Well, this lack of service has escalated over the last year or so... Mastro Auctions is no longer, but seems to have taken care of its customers ... Thank god. But it does seem inevitable that there may be one or more auction houses that still will become casualties of this terrible time. Can a lawyer really help a consignor in this time of need? They can sure try, but you can't force somebody to pay money if they can't pay it... Lets face it, there are many people and businesses that are in trouble, but it seems to kind of have an extra burn to it when it has to do with the sports card and memorabilia hobby. At least it does for me. When the hobby was at its peak, these businesses thought they were at the top of the world. Nobody could break them ... Now, they seem to want pity like everyone else. Also, at my previous jobs, sometimes, I was censored a bit, or just couldn't write what was on my mind. I want to let everyone know that this will not be the case with collectgreenbay.com. I want to focus on every aspect of the hobby; the good, bad and the ugly. As long as it's truthful, its fair game on this blog.